Tracker Software Products :: Knowledge Base :: How do I use the Stamps Palette to create and save customized stamps for the Stamp Tool? How do I use the Stamps Palette to create and save customized stamps for the Stamp Tool in V6 or the V7 Classic UI? Images are usually in raster format and will pixellate if zoomed to a high degree. Therefore it is advisable to create stamps from pre-sized images. (Vector-based images do not experience this issue). If a transparent background is desired for stamps then a suitable image format must be used. The formats *.gif and *.png support transparency but *.jpg and *.pdf do not. N.b. Microsoft Paint does not handle *.png transparency well, but most modern graphics programs do. GIMP is one such program. A free GIMP download is available here. PDF files that contain transparent images/objects without backgrounds (such as scanned signatures) can also be used to create transparent stamps - empty space on the page will be ignored and the resulting stamp will be comprised only of the content on the page. 1. From the Home tab, or the Comment tab and click the bottom section of the Stamp Tool icon then click on Stamps Pallet. 2. Click Add New then Add New Stamp from File to launch the File Open window. New Stamp fom Selection to create a stamp from the currently selected content. 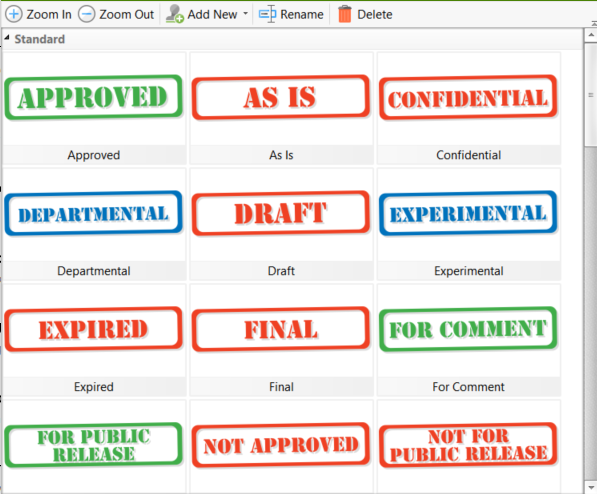 New from Active Document to convert the active document to a stamp or Add New from Clipboard to create a stamp from the current clipboard content. 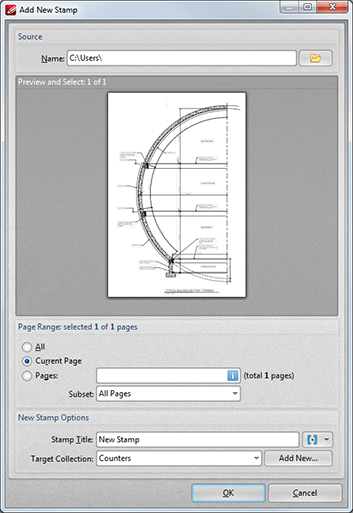 Use the Page Range options to determine the document page used for the stamp. If mutliple pages are selected then a stamp will be created for each page. Name the stamp and select the collection to which it will belong. Click Add New to create a new collection. Click the blue Macro icon to add a macro to the name of the stamp. Macros are explained here. Click OK to create the stamp. It will then be available in the Stamps Palette and can be selected/used in the same manner as default stamps. 1. Click the dropdown arrow on the right of the icon. A submenu will be displayed. 3. Click New to create new stamps. Please note that custom stamps cannot be saved in the same collection as Standard Stamps. Therefore a New Collection will be created automatically when the first new stamp is created. 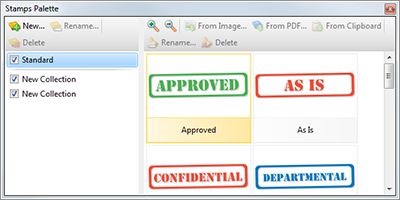 When this option is selected, PDF-XChange Viewer will prompt for an image file to use for the new stamp. Select the desired file and click Open. The stamp will then be available in the new collection of the Stamps Palette. 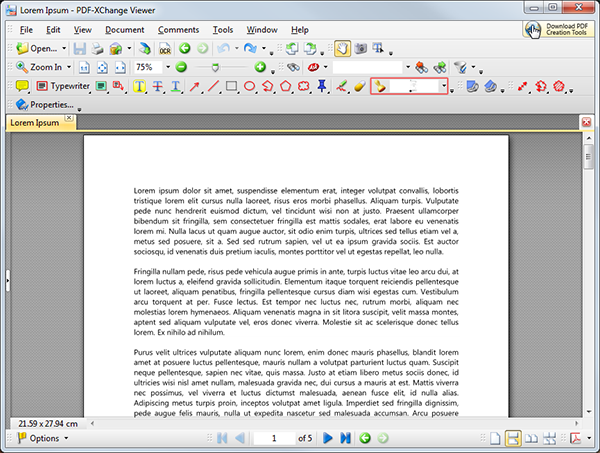 Enter the name of the desired file in the File text box, or click Browse to select it from the files on the local computer. Use the Page number box to enter the page number to be used. Use the Title text box to name the stamp. Click OK to save the stamp. It will then be available in the new collection of the Stamps Palette. Click From Clipboard to create a stamp from the current content of the clipboard. The new stamp will then be available in the new collection of the Stamps Palette and have the name "New Stamp". Select the stamp and click Rename to rename it.